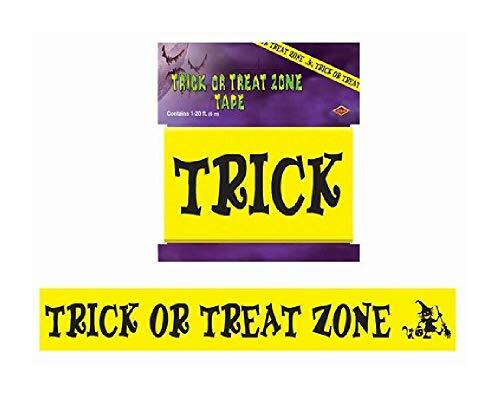 Beistle 00120 Trick Or Treat Zone Party Tape is great for indoor or outdoor use. Made of yellow all-weather poly material with printed black "Trick Or Treat Zone" and witch icon, each Party Tape measures 3 Inch by 20 feet. This product is perfect for wrapping around poles, posts, banisters, or just about anything!. Halloween decoration accessory. 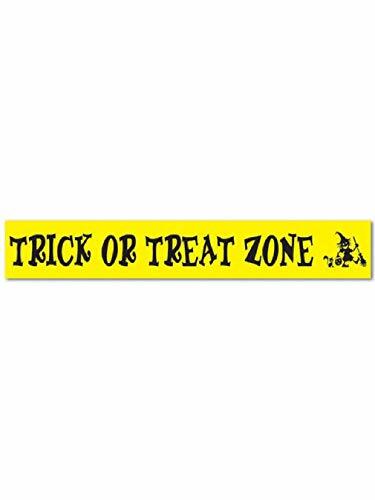 Printed Trick or Treat Zone plastic party tape for decorating indoors or outdoors. Party tape measures 3in by 20ft long, box of 12 party tape decorations. 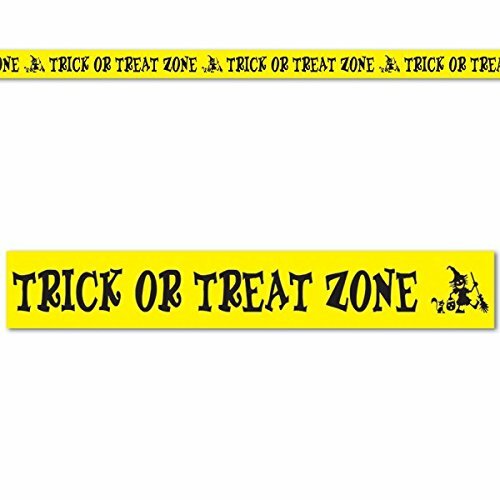 Club Pack of 12 Yellow and Black"Trick or Treat Zone" Halloween Streamers Party Tape 20"
Trick Or Treat Zone Party Tape Halloween Decoration 3" x 20' Caution TapeThese "Trick Or Treat Zone" yellow party tape strips are an awesome decoration for Halloween parties and for your yard during October! Set includes 20 feet of 'party' tape as featured which is great to complete the overall theme. This will be sure to let everyone know there will be plenty of welcomed trick or treaters! These are great on their own and are even better with the other decorations costumes and accessories in our store! 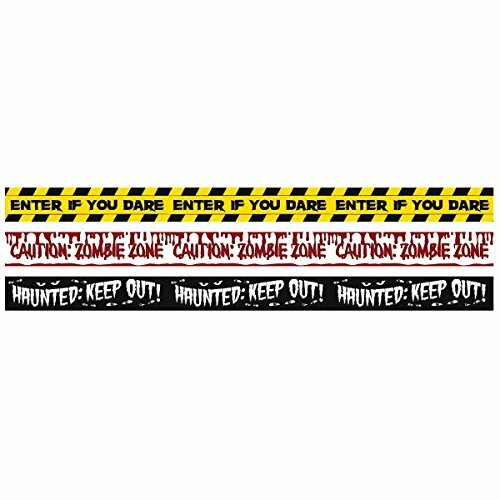 Turn laughter into screeches with our 30' Halloween fright plastic tape banners. Perfect Zombie effects / props for Zombie theme for parties or trick or treat events. Get caught up in this great party decoration! Includes 50' of Caution Tape. 3 Colors / 3 Sayings. Yellow "CAUTION: ENTER IF YOU DARE". Bright Orange "ZOMBIE ZONE". Black "HAUNTED KEEP OUT".Includes FREE Pack of spider web. Scare up your party with spooky spider webs! 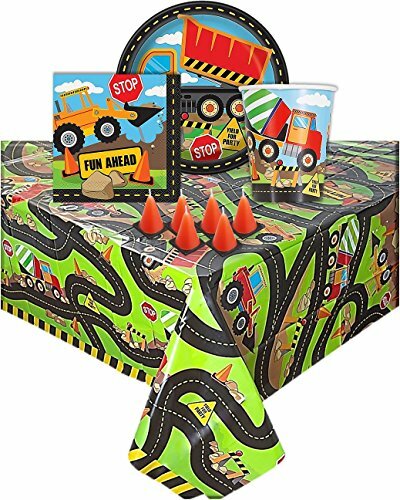 Construction Themed Birthday Party Supplies - Serves 16 Guest, One Plastic Tablecloth 16 Desert Plates, 16 Napkins, 16 Cups, and 6 Cone Shape Candles. Perfect party decoration for indoor and outdoor use! A perfect mood-setter and accessory for your haunted house scene. 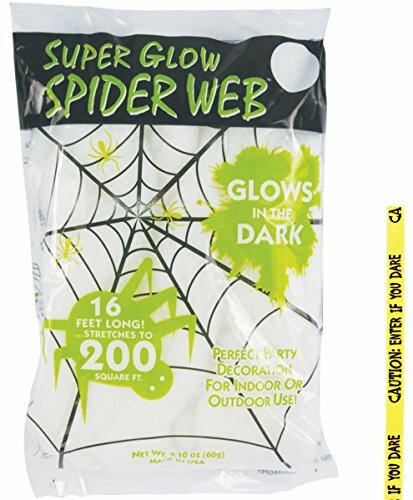 Scare up your party with spooky spider webs! 2.10 oz (60 g). Printed Polybag.Includes FREE Caution Tape Chosen at Random - Yellow "CAUTION: ENTER IF YOU DARE". - Bright Orange "ZOMBIE ZONE". - Black "HAUNTED KEEP OUT". Shopping Results for "Treat Zone Party Tape"